We made it! 22 weeks of eating from the fruits of the land, trying a new recipe or 2, or 30 and perhaps even learning a new vegetable. We are so thankful you’ve taken this journey with us. 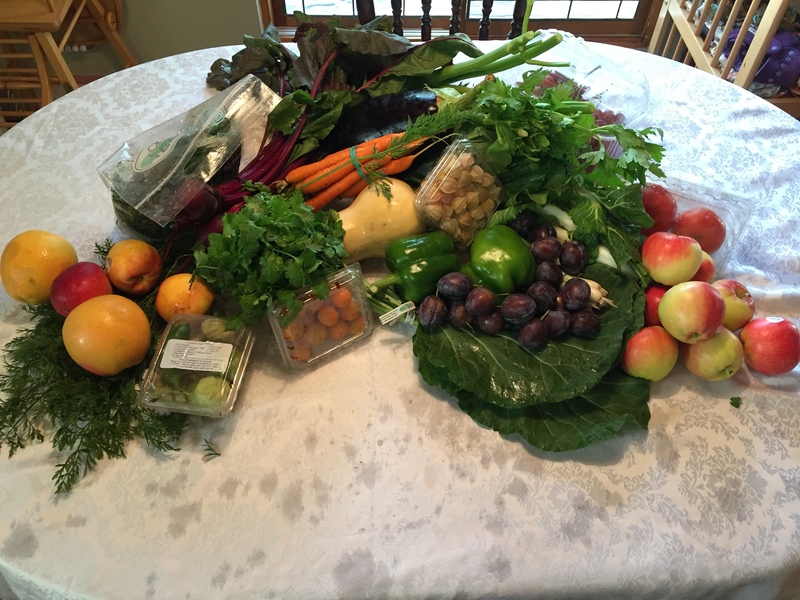 It’s easy to put good food at the bottom of your priority list in this busy world, but taking the time to enjoy unprocessed, organic produce is worth your time for your health, and even enjoyable! We hope you enjoyed this little adventure and are ready for one last summer box, although I don’t think any of us are still calling it summer out there ;). 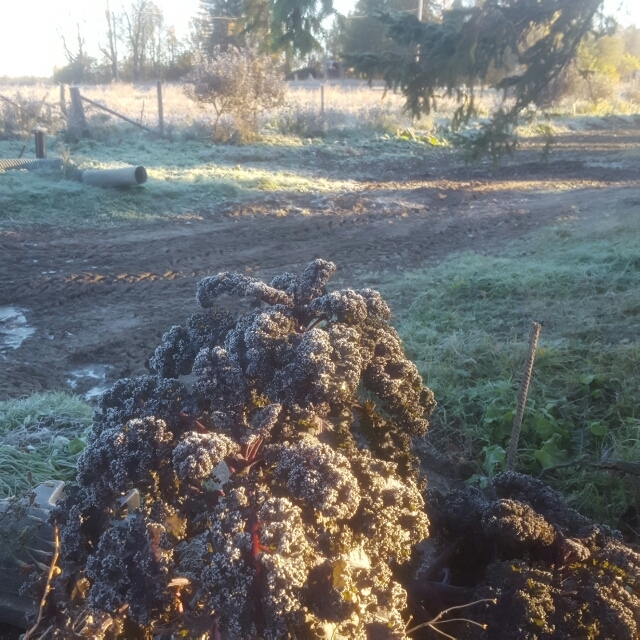 A heavy frost this Wednesday but such a beautiful day! 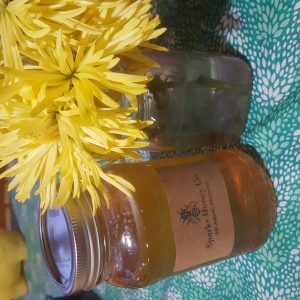 So let me say thank you, thank you, thank you from the bottom of my heart for caring about your food, and how and by whom it’s grown! We sure appreciate it. Now, for this week’s list…. Finally we have those potatoes I have been nagging my husband about for weeks and weeks! They look really lovely, and I think you’ll find they have a wonderful taste. We welcome your feedback! 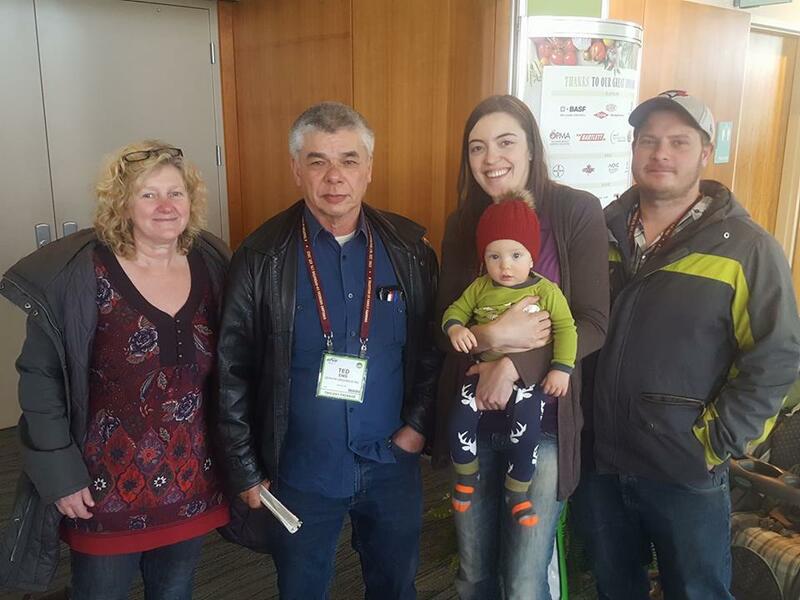 Thanks for choosing us as your farm this year! Sincerely, Jennifer, the Eng fanily, and the Zephyr Organics team. 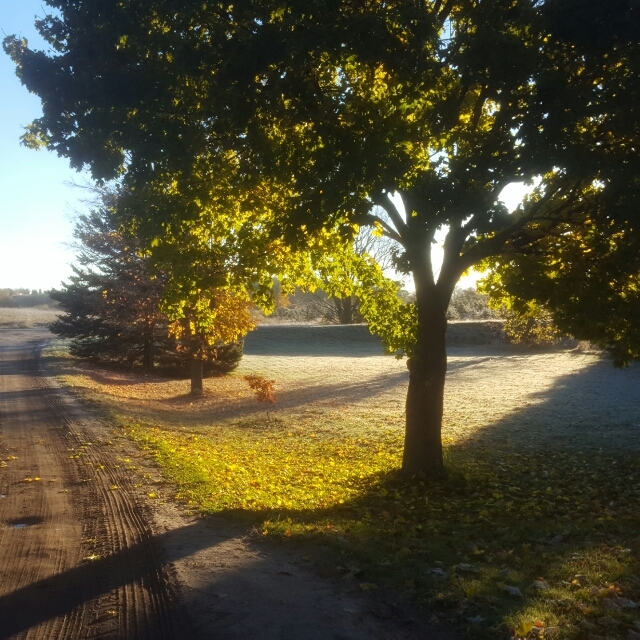 Such a gorgeous morning on the farm! 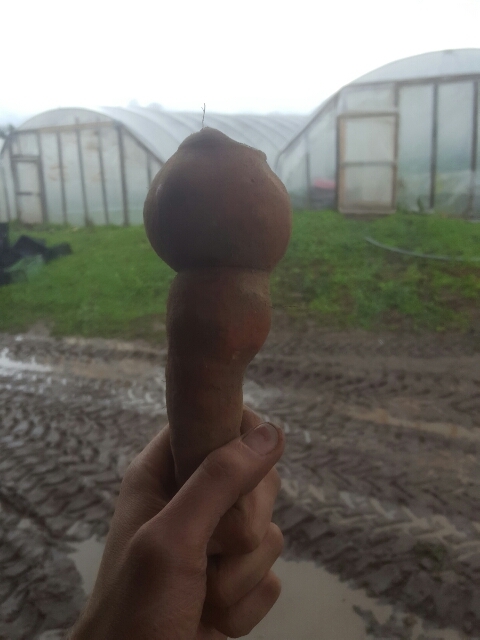 Im pretty excited about our first ever sweet potato harvest! I thought I’d give you a jump on things this week as you meal plan. Brrrr it was cold today. 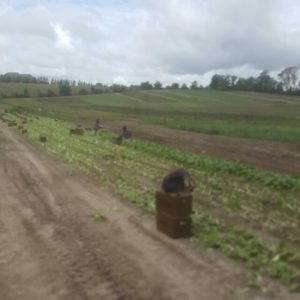 We are definitely in double socks season on the farm, which means we also had to go harvest all the lettuce! 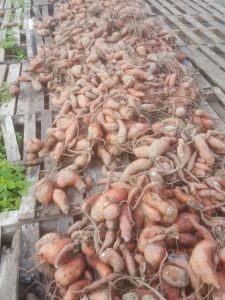 New this past week we just harvested our first ever sweet potatoes! I was quite surprised at how large they turned out with our limited experience growing this crop. 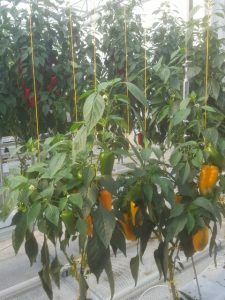 Now that they are harvested they are curing in the greenhouse. In this process the starches turn to sugars (thus making them super tasty!) and they are able to keep longer in storage. I will send them next week or on the last week. We’ll see how long I can wait, as I am so excited for them! We also have some jalapeños for the whole shares to spice up your lives. Some of them have turned red and though they are definitely still spicy, there is some sweetness in there too. I made mine into jalapeno poppers again because I am a little obsessed. Also this week we have Brussels sprouts again. My dear mother made me dinner while I worked today (I know, I am spoiled!) and sped along the cooking process while maintaining some amazing taste of a brussels sprouts-carrots combo by first boiling them until tender, then pan-frying them with cooked bacon pieces, garlic, onion powder and oregano. So good! 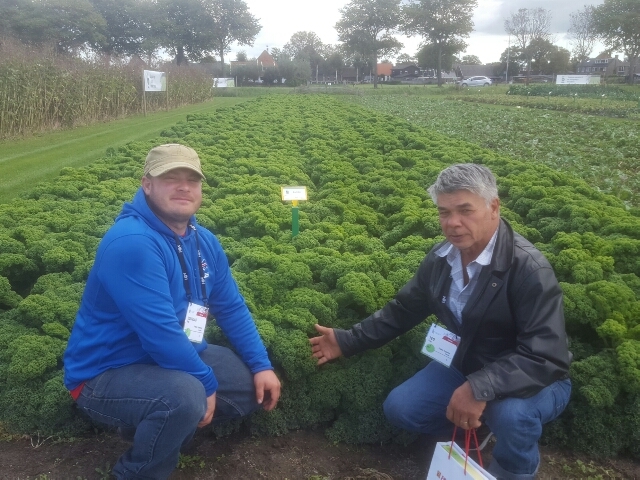 Father and son check out the varieties of one of their favourite crops-kale! 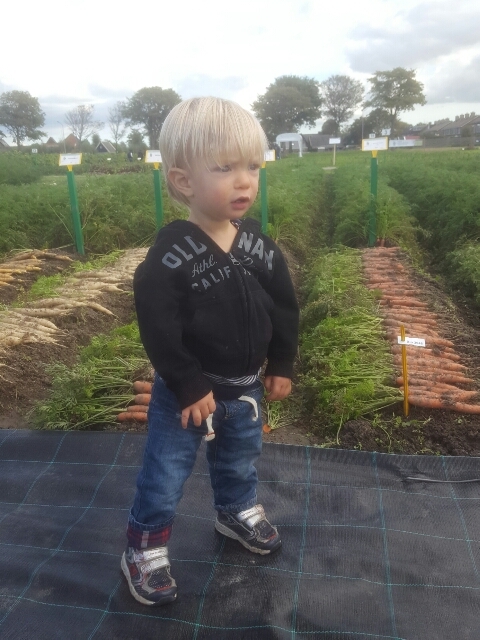 The littlest farmer looking at the different carrot varieties. We’ve spent just over a week here and we finally got to do a farm visit to the farm of one of our seed producers, Beyo. It’s cool to see some of the Dutch culture applied to farming. I love the “less is more” vibe I am experiencing here. The homes here are smaller, people travel less, enjoy tea with friends more, and space is used efficiently. 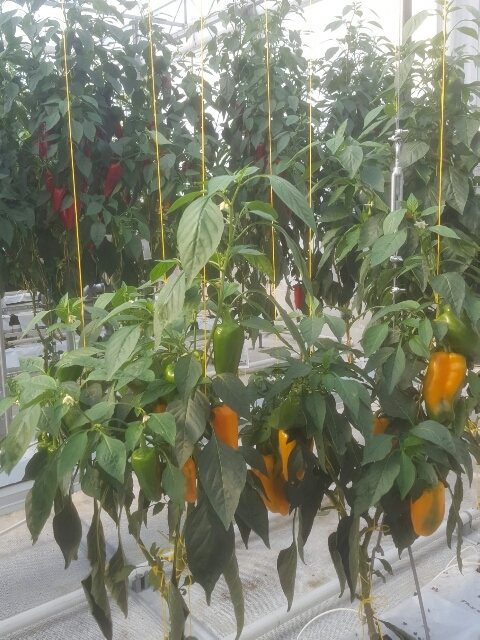 Although we already grow cucumbers in a similar way, I loved seeing the pepper plants growing vertically. They look quite happy! 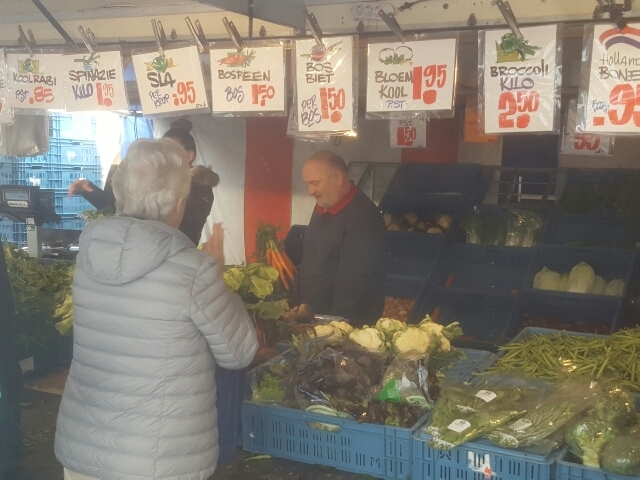 The food here consists of a lot of bread and very delicious cheese, though I have seen a beautiful assortment of vegetables and fruits in the open air markets we have gone to in a few different towns. 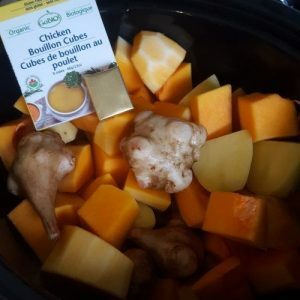 Fall is in the air and Thanksgiving is just around the corner, so I thought it was time to give you a gorgeous little pumpkin to add some hearty flavour to your dishes. No, you do not have to make pie! Pumpkin has a place on your dinner menus too! Here is a recipe idea for you. I can’t wait to dig into some pumpkin when I get home. Feel free to add peppers, greens and other veggies to this dish. 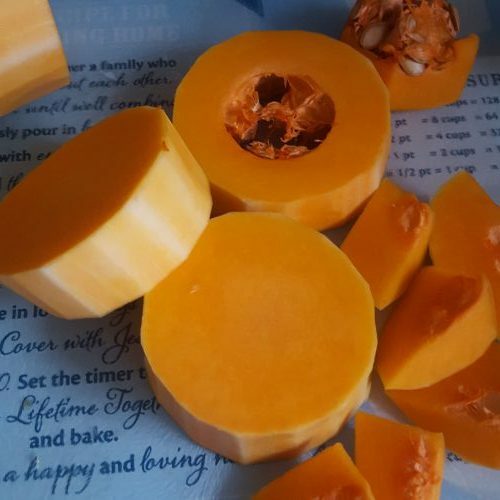 To make the pumpkin puree, all you have to do is cut the pumpkin around the middle (using a large, sharp knife), scoop out the seeds (save for making a snack), and place halves facedown on a baking sheet and bake for about an hour at 400 degrees. Then scoop the flesh out of the skin and put in your blender. Blend until smooth. Voila! Pumpkin puree! Have a simple and beautiful week! Hello from Holland! Doug and I are in the Netherlands to celebrate a family milestone and getting a little break from the busy days of late summer (just about fall now!). 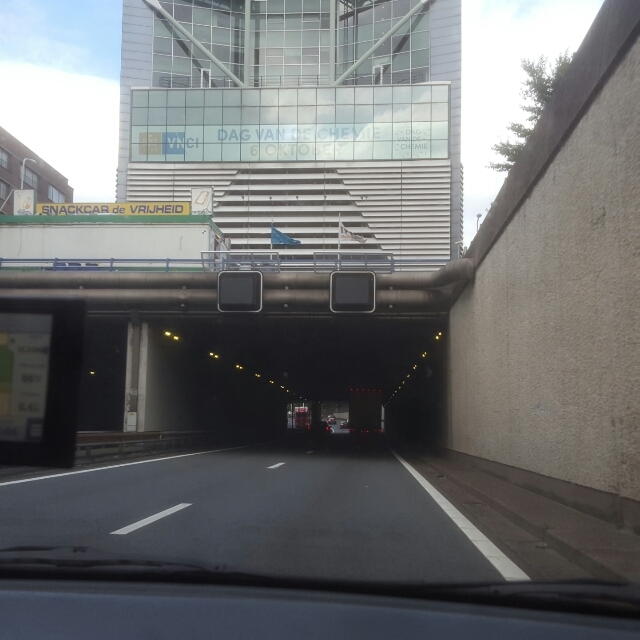 Buildings over roads is an example of how the Dutch use space wisely.. I hope to visit one of the farms of one of the companies we get our seeds from, and take in some local markets! For now I have been inspired by the efficient use of space everywhere: farmers growing crops or pasturing animals on little straps of land alongside highways and buildings that stand above roads. This weeks recipe I’m sharing a rainbow collard green spring wrap with shrimp recipe. Truthfully I rarely follow a recipe 100% since I usually don’t have all the stuff to complete one. This time I sautéed up some of the veggie from the share (tomatoes, peppers, cabbage from a few weeks ago, onions) and then cooked up rice and quinoa. I put that in the center of the wraps and topped it with shrimp I cooked up and the family loved it and I forgot to get a photo. 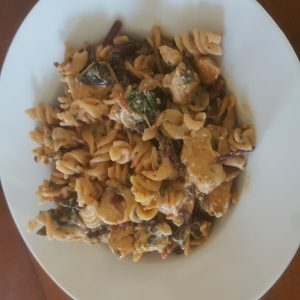 It was our first time using collard greens instead of wraps and everyone enjoyed it! I’ll be doing it again. Hope you enjoy the new fall Veggies and savour the last tastes of summer! Hello everyone. After a few days of reaching into that forgotten box of fall clothes, summer is giving us another surge of heat! Enjoy those last few days of shorts and sandals, and definitely catch some sun when you can. 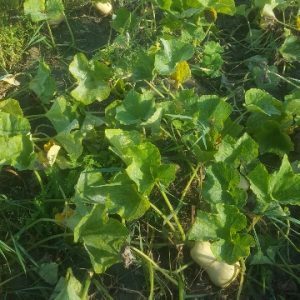 Butternut squash ripe and ready in the fields! The produce mix is still mostly summery, but with a nod to fall with some butternut squash. 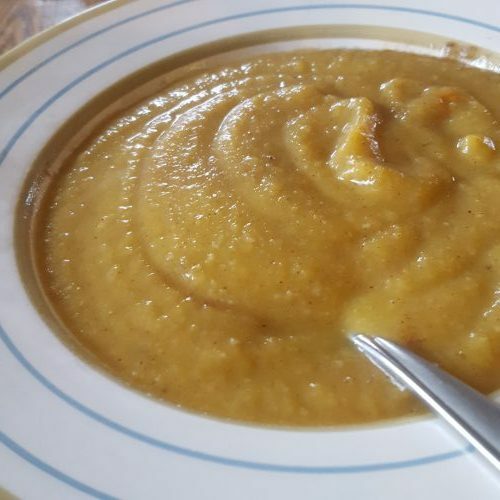 If you have never made butternut squash soup, you are missing out! Butternut is the creamiest squash in my opinion, and especially when you add a few potatoes and puree it…it’s pure creamy soup heaven! 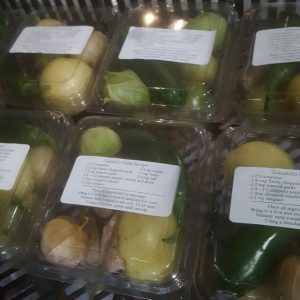 We included a little tomatillo salsa kit with a recipe right in your boxes this week. I adapted it to a smaller size for you to try out, complete with a jalapeño (please use gloves when chopping it up and handling the seeds!) and a bunch of cilantro. Hope you enjoy some refreshing salsa in this heat. If you are getting overwhelmed with tomatoes at this point, why not think red salsa as well? Or load some tomatoes on tacos! Nothing is better than a tomato in season! 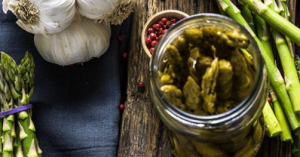 some tomatillo salsa to spice up your life! An exciting note for myself (Jennifer) personally- from the 18th-30th I will be travelling to Holland for my husband’s Oma and Opa’s 60th wedding anniversary! Kind of a big deal, and we just couldn’t miss it. But rest assured, your veggies and fruit will still be delivered on schedule. My lovely sister in law will be responding to my emails and you may also phone her in case of an urgent need (her phone number will be included in my voicemail message). We have some capable workers and family at the farm who will be harvesting and lovingly packaging up your shares. I am so excited but it is also so hard to leave the farm mid-season! 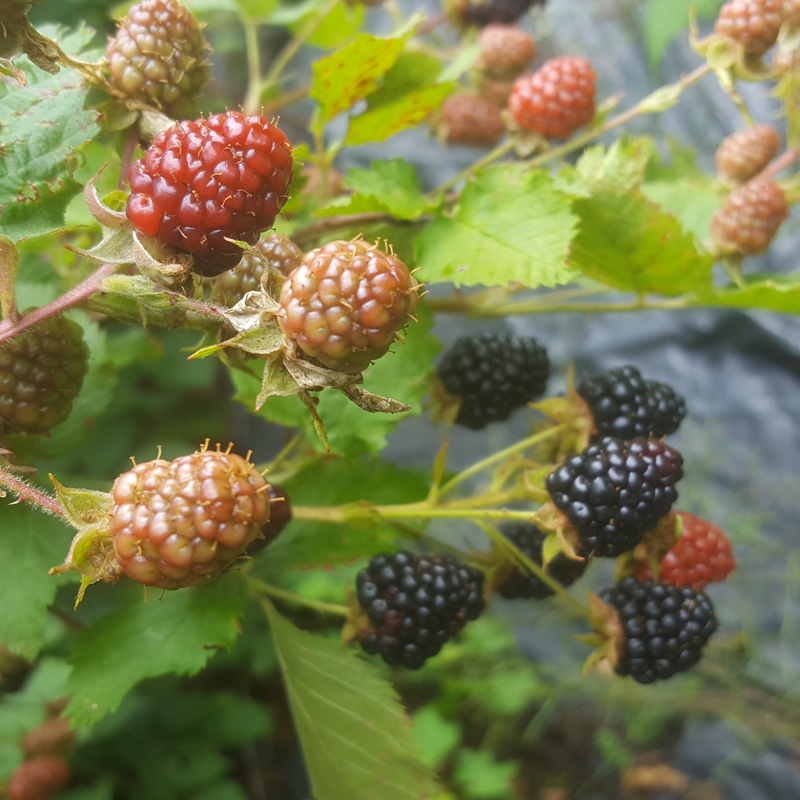 Hope you can savour the summer and summery produce while it lasts! 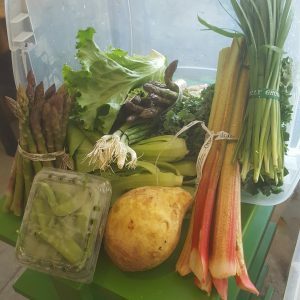 Welcome to a new season of farm share! It’s been a crazy year so far with a very cold April and super hot May, and this week it feels like fall…what?! We also just had our Open House! 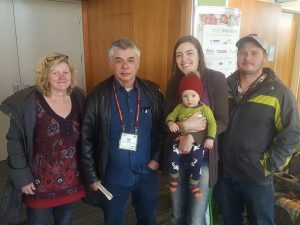 It was a perfect day and it was a pleasure to connect with the awesome folks who support our farm as farm share members, and other great folks eager to see what organic veggie farming looks like. 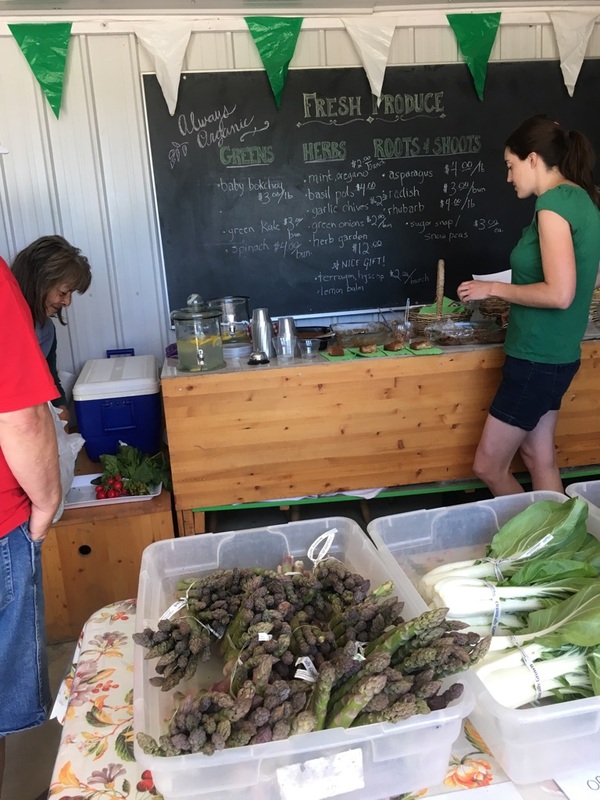 Great people, great produce and of course, great snacks at the open house! I am excited to send you lots of fresh spring veggies, and plenty of asparagus. Asparagus is a short-lived season, so I hope you enjoy it often. Asparagus is fantastic on the barbecue (I put it in tin foil or a barbecue safe dish, slathered in MELT butter alternative and lightly salted). You can also put it right on the grill, but I don’t want to lose any of those delicious spears if they were to fall! We also have some lovely rhubarb. If you were at our open house, you got to try it in gluten-free vegan strawberry rhubarb bars. These were a hit and quite simple. We used quinoa oats due to an oat sensitivity. You can get the recipe here. If that sounds like too much work, why not whip up some rhubarb chia refrigerator jam? Healthy, easy, and great with yogurt, on toast, or topping ice cream. Here’s the recipe. Feel free to tweak the sweeteners to your own taste buds. Finely chop 1lb rhubarb. Add to small saucepan and cook on medium, stirring regularly. 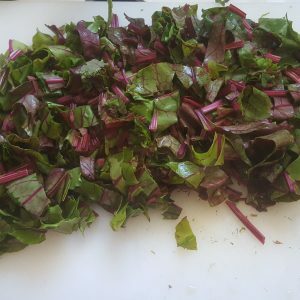 When it begins to cook down, add maple syrup, stevia, optional lemon or cooked beets and chia seeds. Stir and cook until you have a smooth jam. (Don’t worry if it’s not all the way thickened as it will thicken with chia seeds in the fridge). Refrigerate for a few hours and enjoy! 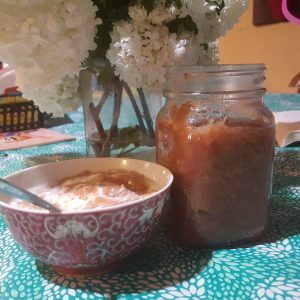 Rhubarb chia refrigerator jam is yummy and so easy! I’m getting in the Christmas mood, and I don’t think I’m alone: I was admiring the festive decorations I saw at many of your homes. Even if you do not celebrate Christmas, I hope you find opportunity to be generous to warm up your surroundings in this cool weather. We had to make a couple changes to our original plan due to availability. 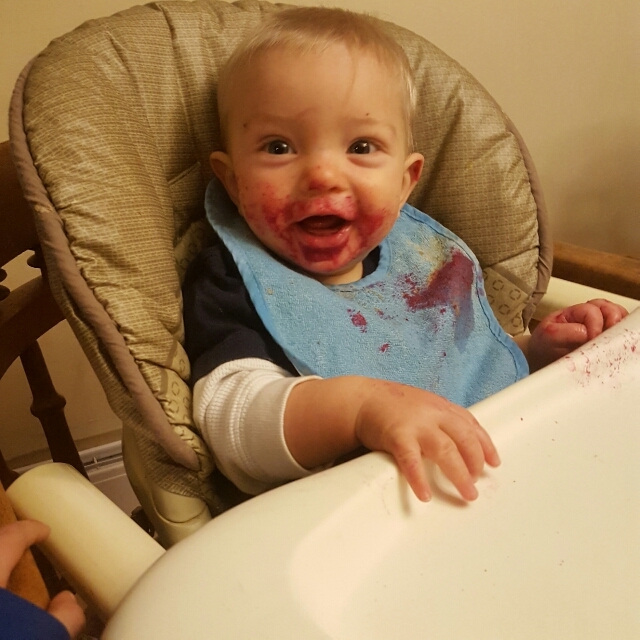 Why don’t people feed babies beets? Maybe this is why (the mess) but he sure liked it! 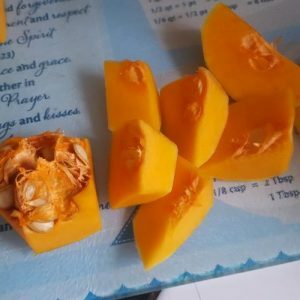 This recipe is quite easy and very tasty! I also tried making Sweet Potato Pizza Crust (gluten free) with the yams. Here are some pics of making it. 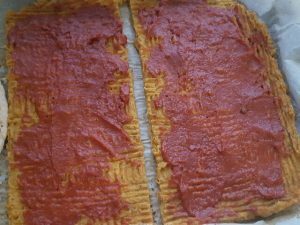 The pizza crust is finally cooked and getting topped up with tomato paste. The finished product. I loved it and found it very satiating compared with regular pizza, but the family was less than enthusiastic and it was a lot of work. I think I’ll stick to my regular pizza crusts and enjoy the yams in a curry or as fries. 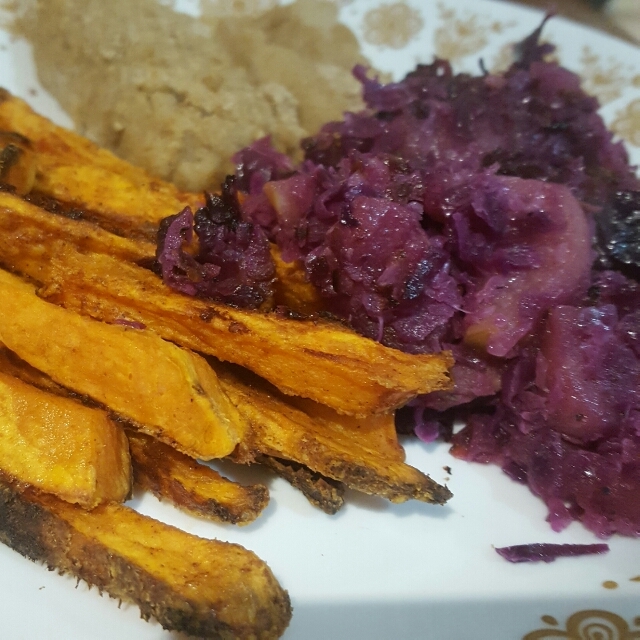 Peel sweet potatoes and add to large mixing bowl with 1 cup almond flour, 1 egg, spices and apple cider vinegar. Mash ingredients together until well combined and dough like. Use rubber spatula to spread on pizza stone until evenly distributed 1/3 inch thick (I used a fork and spread on parchment paper on a cookie sheet). Cook dough at 400 degrees for 30 mins. While dough is baking, shred 1 cup cooked chicken, chop 1 cup spinach, and Sautee on onion until soft. Remove pizza dough from oven. Let cool 20 mins to harden. Spread bbq and tomato sauce on top. Add cheese on top. 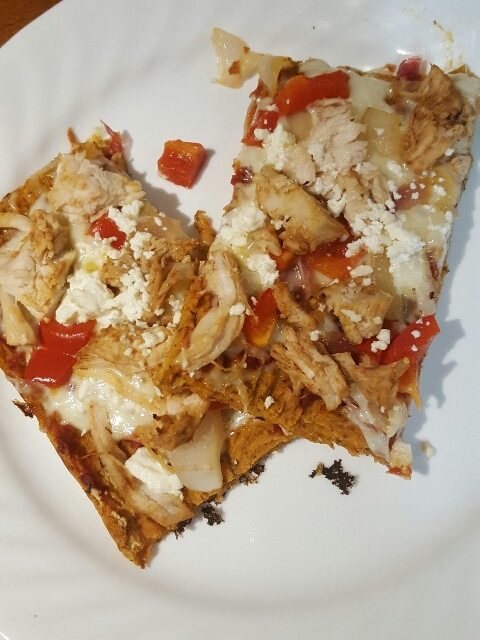 Cover pizza with chicken mixture. Return pizza to oven and cook another 10-13 minutes. Slice and ebjoy. Is anyone overwhelmed by 3lbs of bananas? I can’t seem to keep them in my house. Between easy snacks, slicing and adding to breakfasts and making great gluten free vegan pancakes and treats, my dreams of peeling them and throwing them in zip locks in the freezer for smoothies are often dashed. I love the versatility of a banana! If you haven’t tried that yet, they freeze beautiful with the skins off. There is no need to let even one go to waste! Well that’s it for this delivery. Let the prepping (and eating…) begin!